The Eating Disorders Coalition states that there were around 14 million people affected with an eating disorder in 2012 and many of these found getting a full range of insurance coverage very difficult. Generally speaking, getting treatment for a physical ailment is thorough, but mental health coverage is often less generous. Proper treatment involves a balancing act of medical care, mental health services, and nutritional counseling—each requiring a specialist. This can make the road to recovery hard on some families. The public understanding of these disorders is still limited, and this lack of understanding can also apply to insurance companies as well. Eating Disorders are serious bio-psychosocial conditions. The Treatment of these conditions MUST be multifaceted encompassing biological/medical, mental/behavioral, and environmental approaches. Many times the episodes are caused by emotional or environmental triggers. To mitigate these triggers, sometime inpatient therapies are required. The full treatment can last anywhere from 5 years to a lifetime. 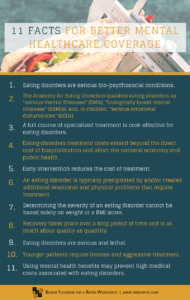 The Academy for Eating Disorders qualifies eating disorders as “serious mental illnesses” (SMIs), “biologically based mental illnesses” (BBMIs), and, in children, “serious emotional disturbances” (SEDs). According to the Mental Health Parity Act of 1996, mental health care coverage and research should be equal to that of medical disorders as well as severe mental illness. A full course of specialized treatment is cost-effective for eating disorders. While the overall cost of treatment is high, those who relapse need to begin a new treatment regimen and thus incurring a larger lifetime healthcare cost. 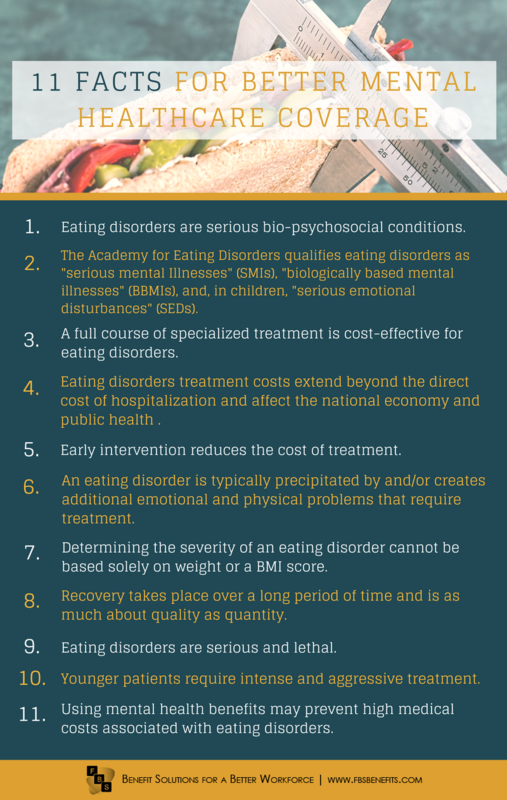 Eating disorders treatment costs extend beyond the direct cost of hospitalization and affect the national economy and public health. These disorders can compromise a person’s physical health and emotional well-being to the point of disability. Ongoing physical complications such as early osteoporosis can cause an inability to function in society as well. Early intervention reduces the cost of treatment. As with most serous conditions, early treatment is the key to full remission. However, many times the difficulties of proper diagnosis and availability of treatment can delay and thus elongate treatment. An eating disorder is typically precipitated by and/or creates additional emotional and physical problems that require treatment. Other serious mental or social issues often accompany eating disorders such as major depression and anxiety disorders. 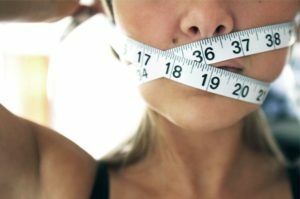 Determining the severity of an eating disorder cannot be based solely on weight or a BMI score. Many health care companies have been known to refuse treatment if the person’s Body Mass Index score is not low enough or may even discharge a patient solely on the BMI without considering the mental/emotional state of the patient. Recovery takes place over a long period of time and is as much about quality as quantity. Patients who receive long term care with a regular therapy sessions tend to do better. There is no evidence that short term therapies are effective in treating eating disorders. Eating disorders are serious and lethal. Eating disorders are the third most common chronic illness in teenage girls in the US. In a six year follow-up of 196 female bulimic patients indicated 59.9% had achieved a good outcome; 29.9% a poor outcome, and 1.1% were deceased. Mortality rate increases with the duration of symptoms. Younger patients require intense and aggressive treatment. Irreversible damage can be done such as growth retardation, delays in puberty, and early osteoporosis. Using mental health benefits may prevent high medical costs associated with eating disorders. Due to the extensive and serious physical ailments that can result from eating disorders, it logically makes sense that proper treatment of the mental disorder would prevent the need for treatment of the physical disorders later. Doctors, therapists and insurance companies must work together and communicate well in order for someone with an eating disorder to get proper treatment. If you or someone you know is needing help with an eating disorder, please call the NEDA helpline at 800-931-2237. If your company is looking for more health and benefit resources, call 800.583.6908 or visit or speak to a benefit consultant to see what we can do to help make you healthier and happier. Next Don’t Overlook Vision Insurance Benefits! Previous FMLA – Does it Apply to You?